NFC technology as a mobile pay technology never lived up to high expectations. Never mind, say analysts, because NFC, which stands for near field communications, as a wireless technology that can transfer data at short distances, may be the starter for innovative applications to come. 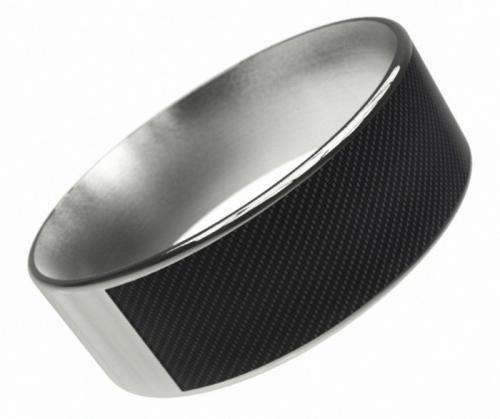 A Kickstarter NFC-enabled, NFC Ring project now under way is a case in point. This is a ring made to be worn on the finger at all times, like a wedding band. The promotional video says that the ring allows the user to unlock a door lock that is NFC-enabled, unlock a smartphone just by touching it with the ring, or, for those so inclined, can hold your bitcoin address. The team behind the Android-based ring points out that it does not work easily with all NFC-enabled phones, the Samsung Galaxy S4 and Blackberry Z10 to be exact. For those devices the team warns that "you will need an alpha size ring," which is "really only for chaps with big fingers". Pledges are for £25 and above. There is a normal size ring and an alpha man size ring. The "normal size ring" is ~7mm wide. The ring does not need battery power. The ring itself is a titanium band. Built into the ring are two inlays with NFC-ready chips in them. One of the transmitters is for public information and a smaller one on the inside is for private information. The two-inlay design was created for user security, and the wearer would be using different types of hand gestures to share different kinds of information. The ring's components are listed as a clear RFID passive coating, inlay cover, NFC inlay with NTAG 203 chip, RFID reflective material, and Titanium/steel ring. "Creating an open source platform will enable third parties to adopt the NFC Ring and consider making their devices NFC-ready." They look forward to more NFC ring applications taking off in the future. They have exceeded their funding goal of £30,000 with a total of £40,535 at the time of this writing. The project will be funded as of August 19. NFC Ring is from British designer John McLear. According to the site, "We have been working on developing the NFC ring for over a year, our product was invented by John McLear to automatically unlock his mobile phone and to make jewellery [sic] practical. Ultimately, John knew at some point in his life he was going to have to wear a ring, and he wanted the ring to be practical, but personal." How strong is the encription? Is it based on RSA. I think they haven't heard how easy it is to hack someone using an NFC device. It goes like this: NFC user parks car in front of store and locks it using his NFC device (in this case by simply walking away until the NFC device is outside the range of the car's sender/receiver unit). So far, so good, so convenient. Perp 1 follows NFC user with an sender/receiver in his pockt. Gets in line behind the NFC user. Perp 2 stands next to car with an sender/receiver transmitting the priodic signal from the car to Perp1. NFC device is thereby fooled that it s closed to the car and transmits code which is relayed via the sender unit fom Perp1 to Perp2. Car is thereby fooled that the NFC device is close to the car and unlocks. Wouldn't the car die as soon as perp 1 is no longer in position to relay the signal? They should add a switch that needs to be pushed to activate the NFC presence or activation. It will not make it much more difficult to use, but it will stop relay-transceiver hacks. It's a trick that was widely used to clean out cars in mall parking lots - not steal the cars themselves. And even if: If you use the NFC to start the car then that's it. A car won't shut down simply because it can't get the signal (you might have put your hand inside a metal lunchbox or similar which would block the signal just as well). And when you look at NFC devices for locking your front door (or initiating a financial transaction) ... well ... once that is open(accessed) you're in until you leave with all the goods. They should add a switch that needs to be pushed to activate the NFC presence or activation. Stuff like that exists. They're called digital keys - and you very likely have on for your car already (it's pretty much standard for all cars I know of). However, having to push a switch pretty much negates what NFCs are for. The problem is that NFC doesn't use radio waves. It uses magnetic induction for power and data transmission, which means the signal diminishes at the fourth power of distance, and the typical working range is no more than 20 cm because of that. Furthermore, the data is sent by changing the inductance of the passive device, so it doesn't actually radiate any signal to be recorded. The reciever reads it by sending out a high frequency alternating magnetic field which induces a current in the ring through a resonant circuit. The signal is in how much of the energy put into the magnetic field returns back to the active device's resonant coil. So it's pretty difficult to actually capture the signal as you'd need a valid active transmitter to activate the ring to record its signal. Besides, a man-in-the-middle attack is easily resolved by using timestamps. If the communication takes longer than expected, the device is not genuine. You can think of the system like two people pulling on a rope. The active end tugs on the rope periodically to feel it, and the passive end either lets it go easily, or resists the pull a little bit to transmit information. In order for a third guy to relay the transmission elsewhere, he'd necessairly introduce delay that would put the two guys tugging out of sync with each other which would be easy to detect. Titanium rings last a long time. But can't be easily removed at times. Fingers tend to be removed before such rings. "NFC technology as a mobile pay technology never lived up to high expectations." In many European countries it`s now incorporated into the new bankcards. You can swipe it over the counter and even leave it in your wallet and make a payment of up to 25 Euro`s per day without entering a pin code (only press confirm). This saves a lot of time at the counter of supermarkets, etc. You can set the 25 Euro day max even higher at your online bank page. And of course you can pay much higher amounts anyway by entering the pin code. It`s only a matter of time for more EU stores to switch. This technology has so much potential it`s going to be big. But give it time because it takes 2 to tango. Not just an enabled phone or paying card. The stores, cars, home doors, bike locks, vending machines, data drives, etc need to have it build in as well. Yah they should key this into your metabolism or something or thieves will just be cutting off fingers. Unless you have a gun that is. In America I can understand how people might be concerned with thieves cutting off their fingers, but here in the socialist states we are more concerned about our rings becoming caught on things and our fingers being pulled out of our hands. And I thought that the main concern in socialist states was losing your nuts. I am sure that is what concerns ryggy the most. I've never had to worry about losing my nuts, but I certainly do understand why RyggTard might be concerned about losing his. Male dogs are made much more mellow when theirs are removed. TardieBoy needs to have his removed. Me might not be so spectacularly stupid afterward.